A new era for St. Bonaventure's College and Seminary began with the presidency of Fr. Leo Rizzo da Saracena, one of the most colorful personalities of the early Franciscan Custody. Born in Calabria, Italy, Fr. Leo studied under Fr. 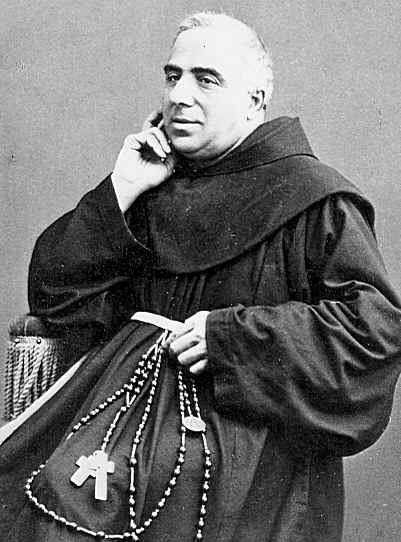 Pamfilo, St. Bonaventure's first president. Under Fr. Pamfilo, Fr. Leo learned to speak English and when the opportunity arose in 1860 he came to the United States. He labored in Texas and in Winsted, Connecticut for some time and with the outbreak of the Civil War he served as Chaplain to the Ninth Connecticut Volunteers. In 1877 Fr. Leo was elected president of St. Bonaventure's College and Seminary. Landscaping and improvements Church, monastery and college buildings took place while he was president, but he was particularly known as a strict disciplinarian. A copy of his 1878 Rules and Regulations is in the Archives' collection and demonstrates this quite clearly. American citizens became the majority of the faculty during his administration, taking over more and more of the duties of the foreign missionaries who had established the college. After his completion of one term Fr. Leo returned to Winsted, Connecticut in 1880 and, with his fiery temperament , won the title "Lion of Winsted". Nevertheless, his humility and kindness endeared him in the hearts of the community. Fr Leo also served as a consulter for the Hartford Diocese under two Bishops. Upon his death in 1897 all public business was suspended and the Governor of Connecticut , the Honorable Lorrin A. Cooke, was an honorary pallbearer. All city officials were present as well as two military officials. Four bishops, more than two hundred priests and fourteen hundred others crowded into the church for the Mass, while an estimated four thousand remained outside. This was a fitting tribute to the unrelenting energy and dedication of a zealous man of God. Link to St. Anthony School, Winsted, Ct. web site. Angelo, Mark V., OFM. The History of St. Bonaventure University. St. Bonaventure, NY: Franciscan Institute, 1961. Hammon, Walter, OFM. The First Bonaventure Men. Paterson, NJ: St. Anthony Guild Press, 1958.